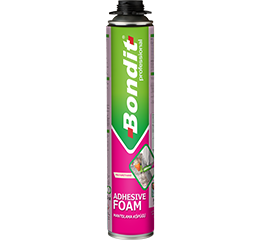 Bondit is a one component aerosol polyurethane adhesive foam curing swiftly with moisture. Providing very fast and powerful adhesion for various construction materials, especially highly recommended for heat insulation systems. Powerful adhesion of polystyrene heat panels (XPS and EPS). Instant adhesion and wall plugging within two hours. More economical. Ready to use in aerosol can. Up to 14 m2 heat insulation panel adhesion for each can. Minimum expansion during drying period. After dried, no further expansion and shrinkage. A lighter material compared to plaster, alternative material, used in heat insulation systems. No more extra burden or weight to building. High yield up to 55 liters, depending on the humidity and temperature. Fire Class: E (According to EN 13501-1. It refers to B2 for DIN 4102). Best for mounting heat insulation panels and filling voids during adhesive application. Advised for wooden type construction materials adhesion to concrete, metal etc. Mounting and isolation for frames of windows and doors.